When you are in Thailand you might notice that the national anthem is played twice a day at 8 a.m and 6 p.m. It is played on all radio and tv stations as well at bus stations, police stations and other civic centres. At these times, it is accepted behavior to stop whatever you are doing and stand to attention. 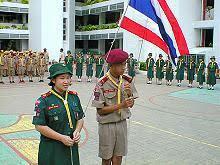 Thailand is the unity of Thai blood and body. The whole country belongs to the Thai people, maintaining thus far for the Thai. All Thais intend to unite together. Thais love peace, but do not fear to fight. They will never let anyone threaten their independence. They will sacrifice every drop of their blood to contribute to the nation, will serve their country with pride and prestige - full of victory. Chai Yo.